As a nutritionist, I hear this often. While I do appreciate that some children truly seem difficult to please at one stage or another, I would like to politely but firmly say that your offspring won’t eat that because you’ve already decided for them. It has happened multiple times in my career as an Early Childhood Educator. For those of you who don’t know, my first chosen field was Early Childhood Education. Parents were often shocked at what their child would eat in a day at pick up time. The scenario would go a little like this…Mom or Dad picks up toddler or preschooler. I tell parent that their child ate salmon salad sandwiches and loved them. Parent scrunches up face and says, ‘They ate that’? Can you anticipate what happens next time salmon salad is offered on the menu? Yep, you guessed it, your sweet child refuses because they were paying attention to your reaction. Your reaction matters more to them than the fact that they actually rather enjoyed salmon. Being a parent is hard, really hard sometimes. There are so many things to keep track of – missing socks, favourite blankies and pieces of valuable art that you mistook for a pile of recycling. On top of that, you are responsible for teaching your child the life skills required to someday leave your nest and be a self sufficient member of society. You know, the type that can go out for dinner and not throw all their broccoli on the floor and demand that their chicken not be touching anything else on the plate! Add in the piece about self esteem, a healthy diet and making friends and your head feels like it is about to explode. Are you a face scruncher? Here is the thing – just like being a child is a learning experience, so is being a parent. If you are one of those face scrunchers, I’m here to tell you there is hope! You haven’t ruined your child’s palette and there is still time to encourage adventurous eating around your table. We are all entitled to have our favourite foods and those that we could live quite happily without. My nemesis is shrimp. Never liked it and don’t see that changing in the near future. Even thinking about the texture and flavour is disturbing to me. Guess what though? When the kids saw it at a party and wanted to have a taste, I let them have at it and kept my feelings to myself. It is important for parents to allow children to decide for themselves what they think about a particular food. While we do want to influence them to healthier choices, ultimately one day, they will be independently deciding what they choose to eat. I want my kids to be open minded to new foods and dining experiences. Adventurous Eating is Around the Corner! If you feel like you’ve lost your way on the path to adventurous eating, don’t despair! Start with a small step. At our house, we implemented the one bite to be polite strategy when the kids were small. It was important to me that my children give foods, flavours and textures a fair shake. They get to decide how big that bite is, even if it is a crumb too small for a mouse. With one bite out of the way, the decision is all theirs as to what happens with the rest. When the kids were really little, and a bite of something was too tall of a task, we had them smell and then lick the offending item. This provided an opportunity for me to be satisfied that they at least tried it and they were allowed to stick their tongue out at the table. Win-win for everyone. 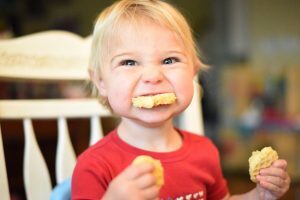 Now, please don’t mistaken my enthusiasm for having children try foods on their plate as the same thing as clearing their plates. I remember being told to do this from time to time because children were starving in other countries. While I did have compassion for others around the world, I failed to see the connection between me eating all my food and those poor children not being hungry. Packing up my food and sending to where it was needed seemed like a better plan. Forcing a child to clear their plate or dessert bartering sets the stage for an unhealthy relationship with food. I’ll share more on this in future posts! But for now, try encouraging the one bite to be polite strategy and let me know how it goes! And, in case you were wondering, the one bite to be polite policy applies to moms and dads too. Love this blog post Amy! We too have a similar policy… we call it the “no thank you helping” !